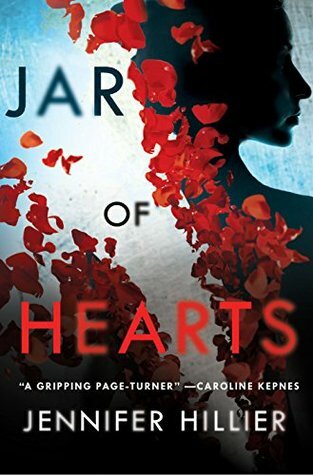 Jar of Hearts by Jennifer Hillier is one of those thrillers that you may not want to pick up until you have a good block of free time available to read. This one was the pure definition of a page turner that grabbed me early on and didn’t want to let go causing what I like to refer to as a case of “one more chapter-itis”. The story is told in five parts switching the point of view as the story goes on. In the beginning readers meet Georgina “Geo” Shaw who is now an up and coming executive and engaged to be married. Geo’s past has suddenly caught up with her though sending her picture perfect world spiraling out of control. Kaiser Brody has been one of Geo’s best friends in high school along with Angela Wong. When Angela went missing all those years ago the friendship between Kaiser and Geo fell apart and now years later Angela’s body has been found leading Kaiser back into Geo’s life but not as a friend, as the one to arrest Geo for the murder of Angela. Jennifer Hillier has crafted Jar of Hearts to draw in readers and then keep their attention by slowly peeling back the layers of the story in each part of the book. As soon as you think you know something another twist will come along to make you rethink what you know as she digs deeper and deeper into the secrets of the past. The only reason I’m taking a half star off of this one and rating 4.5 is the final wrap up seems to be one a reader needs to suspend a bit of disbelief a bit but that in no way changed how engaging and intriguing it was. Definitely recommend checking this one out if you get the chance. Jennifer Hillier writes about dark, twisted people who do dark, twisted things. Born and raised in Toronto and a proud Canadian, she spent eight years in the Seattle area, which is where all her books are set. Great review Carrie. I have this one coming up shortly. Really looking forward to it. Great review, Carrie. I have an ARC of this and can’t wait to read it. So glad to hear that you enjoyed it.